Home » You lose it, we find it. Safedome is the new way to keep your valuables safe. 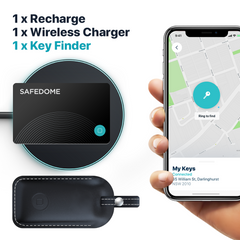 Designed to fit in your wallet along with your credit cards, Safedome connects to your phone via Bluetooth and alerts you if you leave your wallet at home or it goes missing. When you receive your Safedome card, simply download the app from the App Store or Google Play, and follow the instructions to connect your card to your phone. You'll be up and running in just a few minutes. The size of a credit card, Safedome fits right in your wallet. You can also slip Safedome into your passport holder, or attach it to the back of a laptop or tablet. It’s the thinnest, most durable and most powerful product of its kind on the market. Know where your wallet is, always. 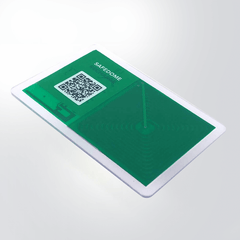 The Safedome card connects to your phone via Bluetooth, and alerts you when your phone and wallet separate. Find it on a map. See your wallet's last known location on a map. Set and forget. Simply open the app, follow the instructions to connect the card to your phone, then just let Safedome run in the background. Set alert free zones, like home or work, so you only get alerts when you need them. Enjoy peace of mind. With a single glance, the dashboard will inform you if your wallet's safe or at risk. Keep an eye on your personal data. Safedome can also scan your email addresses and notify you if your personal data is compromised. Receive support if anything goes wrong. We've got industry experts on hand to help if you lose your wallet, passport, driver's license or credit cards. Here are seven things that might surprise you about the Safedome card.